Varicose veins – veins, associated with weakness or functional impairment valvular and vascular wall. All veins have valves that transmit blood only in one direction. In case of violation of valvular blood stagnates, condensed, and may begin to clot form (blood clots). Contributing factors to the development of the disease are congenital weakness of the vascular wall, pregnancy, obesity, prolonged stay in a standing position, hard physical labor. 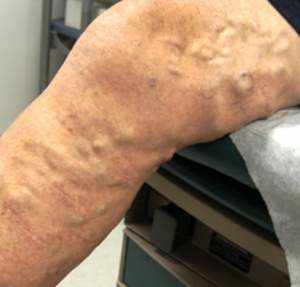 The appearance of varicose disease is also associated with vascular injury, thrombophlebitis. For varicose veins are several stages. Under compensation patients complain only cosmetic damage in the form of convoluted varicose veins of the lower extremities. With the progression of the disease occurs subcompensation. At this stage, there are complaints about swelling in the feet and ankles, fatigue and “bursting” of leg muscles, cramps at night. In decompensated stage swelling take consistent, veins dramatically expanded, often concerned about severe pain and cramps in the calf muscles. Complications that may arise as being sub-compensation and decompensation include thrombophlebitis, ulcers and infections of the skin. MAGOFON device’s treatment carried out at all three stages of the flow of varicose veins. By simultaneous exposure of alternating magnetic field and vibroacoustic oscillations, runs the acceleration of capillary blood flow, improves contractility of the vascular wall and smaller varicose veins, especially in the first stage of the disease. In parallel with it, increases vascular permeability and tissue, a direct consequence of which is the acceleration of resorption of edema. Improves blood circulation in the muscles of the lower leg. All this helps prevent the appearance of sharp pains and cramps. Improve of microcirculation also leads to higher rates of metabolic processes, which promotes the healing of venous ulcers. Lowering blood clotting action of an alternating magnetic field helps to prevent thrombophlebitis. Procedures: MAGOFON still installed or committed arbitrary slow motion along the veins. Procedure can be carried out twice a day, but only one limb. If the disease affected both limbs, device uses alternately on each, for example, 3 minutes and 3 minutes left – to the right. In this case, treatment should be limited to one procedure per day. A second course should be done within 30-40 days after the end of the first, and support – in 3-4 months after the second. Attention! MAGOFON is contraindicated in propensity to thrombosis, the presence of blood clots and acute thrombosis.